One look at the Ultimate XPLOR and the company’s marine origins are immediately apparent. Aesthetically very different from most camper trailers, this sleek fibreglass transformer was a curious sight cruising along the Princes Highway behind the Pajero, its aerodynamic lines and carefully crafted lightweight construction making for a very comfortable cruise as we pressed up the NSW coast from Moruya to Kiama. 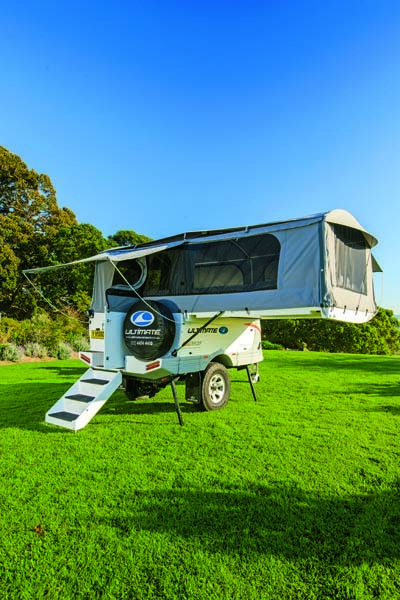 Ultimate is an all-Australian company that has been building campers on the NSW South Coast for almost 20 years, ever since founder Michael Hackett first applied his skill as a boat builder to construct a camper trailer in his garage. Things have gone gangbusters for Ultimate since then, and the brand now enjoys a cult-like following of dedicated customers across Australia. Ultimate has grown to the point where it’s now one of the largest private employers in the Batemans Bay region, with around 50 staff. Despite the ever present financial temptation to use imported components, Ultimate continues to make everything in-house at its Moruya factory — a fact which becomes apparent as you notice the level of quality of every component aboard the good ship XPLOR. 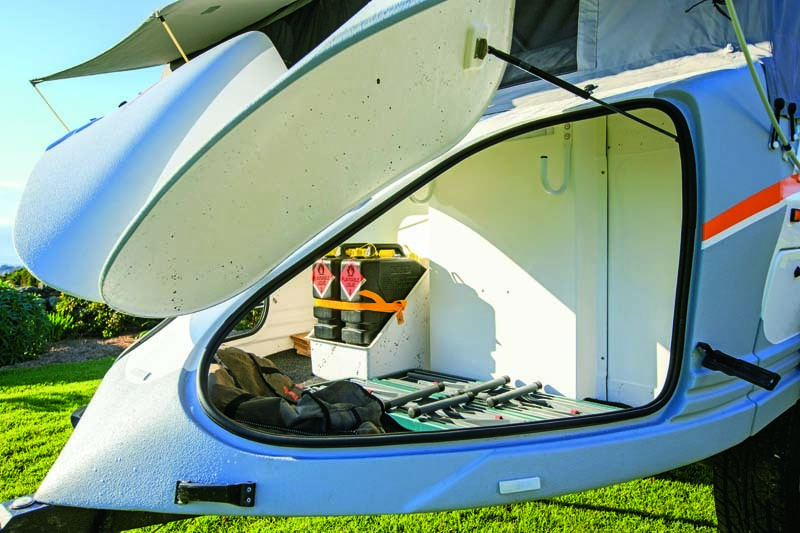 Like all Ultimate campers, the XPLOR is constructed of marine-grade composite materials, consisting of fibreglass with carbon fibre strips for added strength. Despite being a luxury camper with loads of fruit, thanks to this unique construction the XPLOR weighs a very manageable 840kg tare, making it suitable for a broad range of tow vehicles. Indeed, Ultimate claims the XPLOR is as offroad as the car that tows it. If that car happens to be a large 4WD, like CTA’s Pajero GLX, you’ve got a healthy payload at your disposal and plenty of scope to ditch the blacktop and lose yourself in the wild. 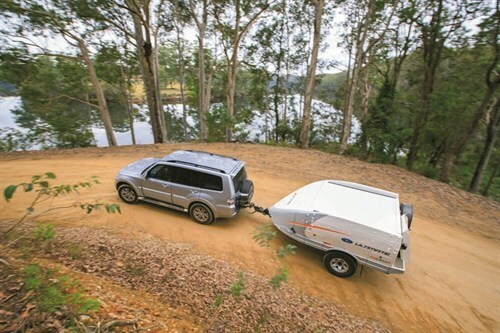 Alternatively, if it’s a mid-sized family wagon or small SUV, you can still tow the XPLOR comfortably to your favourite seaside caravan park or light offroad holiday destination. A Y-shaped chassis constructed from high-tensile DuraGal steel makes the XPLOR exceptionally strong and gives it its unique, aerodynamic pod shape. This sits atop independent trailing arm suspension with Lovell long-travel coil springs and Koni hydraulic shock absorbers. With a line-up of offroad artillery like that and 570mm of ground clearance, you can be confident this thing will follow you to the ends of the earth. On our way north we headed into the picturesque Shallow Crossing State Forest north of Bateman’s Bay, where the XPLOR confirmed our suspicions that it eats roads like this and worse for breakfast. Wherever you’re headed, if you’ve got the right vehicle you’ll get there with the XPLOR. Like a duck to water the XPLOR relished the opportunity to cool its feet in the few creek crossings along the way, and looked gleefully at home with white water deflecting off the sides like a speedboat. Marine seals throughout provide enduring protection against water and dust. Indeed, the company claims that when submerged a metre deep in water, the XPLOR can actually float. This doesn’t surprise me in the slightest given its marine styling, in fact I’m surprised it doesn’t come with oars. The XPLOR comes 16in brushed steel rims and all-terrain tyres as standard, and is hitched up with a Treg 360º offroad coupling. There’s a whopping 1340L lockable storage compartment at the nose, accessible via large, fully sealed upward opening doors on either side and inclusive of two jerries in holders and a mount for annexe poles. The 110L water tank has an electric pump as standard, but for on-board hot water you’ll need to upgrade to either a Companion or Sinergex system for an additional $2000. Alternatively, choose a Companion Aqua Cube portable system for $329. 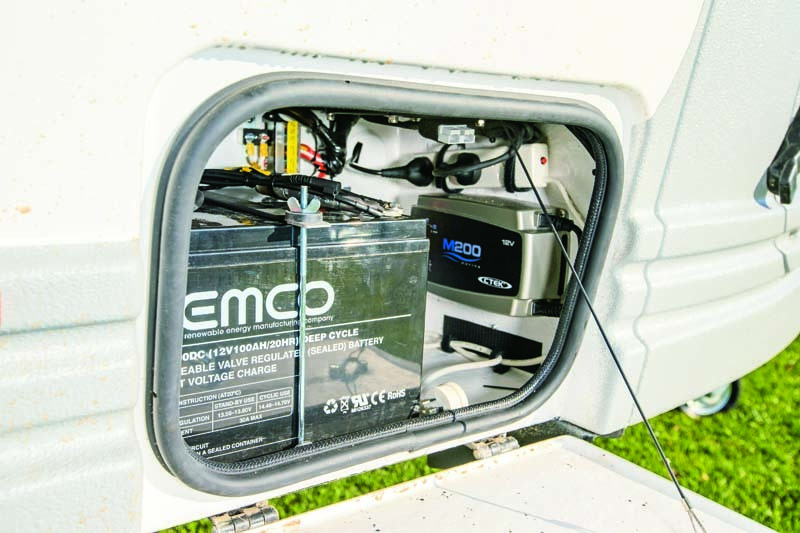 As standard you get dual 100Ah AGM deep-cycle batteries, a Redarc 25A DC-DC charger and a CTEK 15A charger, serving six 12V outlets found throughout the camper. There are also two levels of solar upgrades available. I get to see a lot of campers as editor of CTA, and I’ll make no secret of the fact the XPLOR is almost certainly the one I’d choose to own. While there are many reasons for this, the main one is simple: I can put it up on my own. I’m 5ft 4in (163cm) tall and basically always rely on the taller people around me to help set up campers. Needless to say I was a little nervous on this review; I was taking it away for several nights with only our photographer Ellen Dewar for company. Now don’t get me wrong, Ms Dewar is tremendous company and a dear friend of mine, but she makes me look like an NBA player. Would we manage to set the XPLOR up on our own? You betcha. From the top of the stairway I was able to easily raise the gas-strut-assisted fold-over roof to its upright position and gently guide it over by holding onto the internal tent supports under the canvas. Had I struggled with this I could have opted for plan B, which entails standing on the ground and pushing the roof to its upright position using a purpose-built extendable pole that clips securely into place. From there, you walk forward in an arc to get in front of the roof before guiding it down towards you. Two easy options for the vertically challenged, one very big win in my book. It’s then simply a matter of clipping on the four internal support poles to raise the roof and inserting the three sections of the mattress to construct the king-size bed. These ride on the dinette lounge during travel. Unfortunately this system means there is little scope for an innerspring. The quality of the Dunlop high-density foam seems very good and the bed is certainly comfortable, not to mention luxuriously big and well ventilated thanks to large windows along three sides, opened internally as with all the windows. My only gripe is that it’s quite bouncy, even with just one occupant, so amorous campsite activities might be none too discreet, if you catch my drift. Of course, this theory is mere speculation; you’ll have to qualify it under your own, um, steam. While I don’t doubt Ultimate’s claim the bed is strong enough to carry 800kg — it certainly seems very strong — my preference would be for a couple of supporting legs underneath to keep it stable. 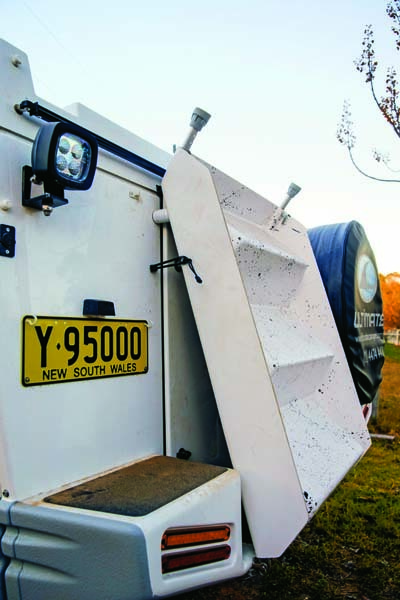 There are “mini awnings” on both long sides of the camper, which are erected very easily and quickly by inserting flexible lightweight poles into brackets attached to the camper. While these serve to fend off the elements and allow you to leave the window/door open in the rain, they do not provide protected outdoor living space and as such I would be optioning up to the canvas awning and walls kit. The whole process of erecting the camper took the two of us just 15 minutes, but I reckon after you’d done it half-a-dozen times you’d knock it over in five. 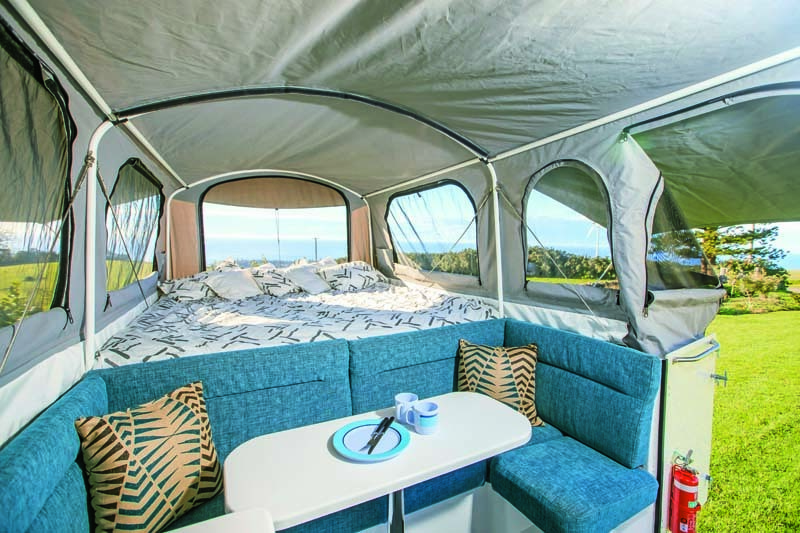 Alex Lowe of Ultimate Campers told us about one of the brand’s customers, who had ordered an XPLOR together with her husband with the intention of taking it around Australia. Sadly, her husband passed away before they had the chance to fulfil this dream. Not to be dissuaded, she embarked on the trip on her own in his honour. 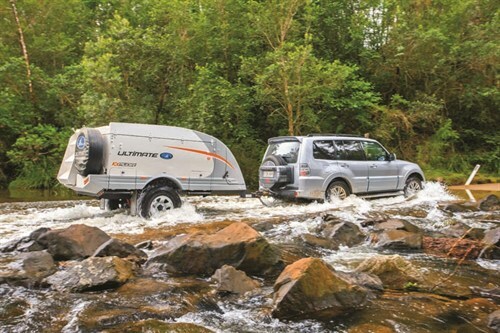 With many campers this simply wouldn’t have been possible, but the XPLOR is lady-friendly in every sense, with all the gear needed to keep the blokes happy, too. 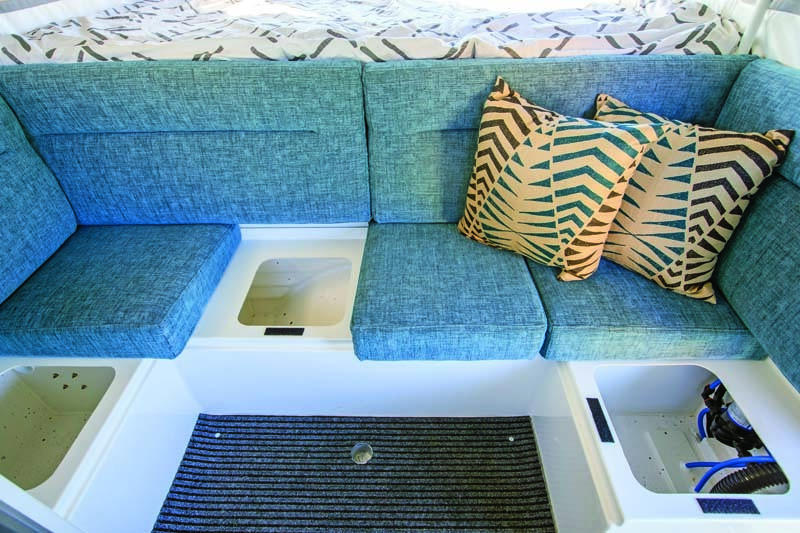 The horseshoe-shaped dinette lounge is stylish and plush, with storage hatches beneath and a removable table which locks into a receiver on the marine-carpeted floor. There is an optional tripod base for outdoor use of the table to save on cargo. 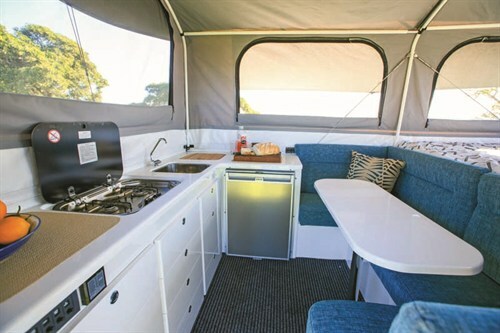 The kitchen is a very civilised affair, with a plumbed stainless steel sink next to an inbuilt chopping board which lifts to expose a storage hatch, and a two-burner Smev stove with a flip-top cover. The latter is serviced by a 4kg gas bottle housed in its own externally accessed compartment on the front passenger side corner, where it is also accessible from the outdoor kitchen. There is provision for two gas bottles here, but you’ll get one as standard. The fridge/freezer is a 118L Waeco, and you’ll have loads of room to prepare its contents for dinner on the beautifully finished white benchtop, which is upgradable to a slick black if you fancy stepping up the glamour. Storage abounds, with cupboards and drawers aplenty, including an extra-large drawer for pots and pans. The interior is lit by an LED strip light over the kitchen; bedside lamps are an optional extra. There’s also an external floodlight above the stairs as standard. The external kitchen is a new option for Ultimate following customer feedback requesting capacity for al fresco cooking, and for me it’s a no-brainer. As someone who loves to cook, the pleasure of doing so outdoors is something I look forward to most on any camping trip. 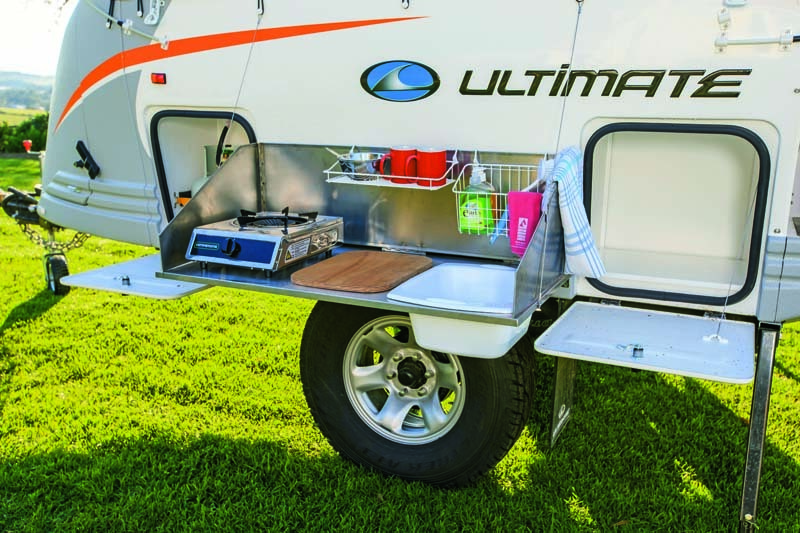 The stainless steel external kitchen clips onto the outside of the camper and would likely be stored in the nose storage compartment. It has a splashback, a chopping board and a sink, but you’ll need to supply the cooktop. I’ve said it before and I’ll say it again: I love this camper. Not only is it a breath of fresh air for a shorty like me to single-handedly erect a camper with ease, but the thing is also laden with niceties to get you way off the beaten track and let you stay there in comfort. 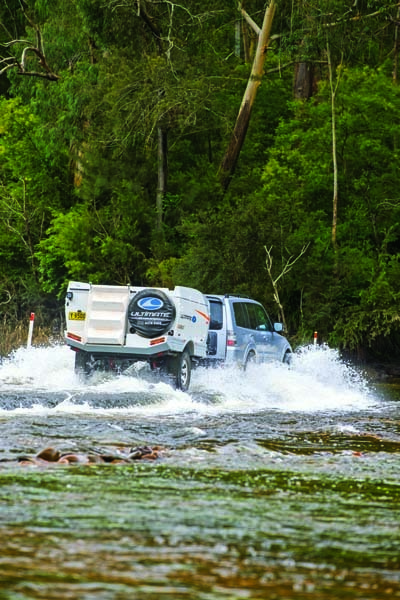 With a starting price at just under 50 grand the XPLOR is at the top end of the market, but for the cash you’ll get a capable and luxurious Australian-made offroad rig. The peace of mind that comes with owning a tried-and-true product from a strong, customer-focused Aussie manufacturer cannot be quantified, particularly as you’re sipping your sav blanc and watching the sun go down over the middle-of-bloody-nowhere without a care in the world. Money well spent. Originally published in Camper Trailer Australia magazine #68, August/September 2013.